Widnes suffered their seventh straight Super League defeat as Hull KR won for the second time in three games to move within three points of the top eight. Rovers led 6-0 at the break thanks to Shaun Lunt's converted try. Ken Sio's early second-half try, also converted by Ben Cockayne, doubled the home side's advantage. But, despite Gil Dudson and Corey Thompson both crossing for Widnes, further scores by James Greenwood and Albert Kelly closed out victory. Cockayne landed all four conversions, while Rhys Hanbury improved both Widnes tries. Thompson's 14th try of the season takes him within two of Super League's top scorer, Castleford's Denny Solomona. 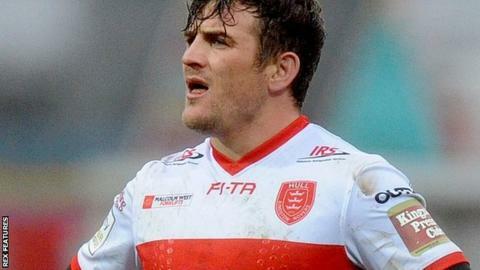 Hull KR coach James Webster: "It was a scrappy game. Widnes came to play and I thought it was a physical encounter. "It wasn't a classic, but it was two desperate teams who had a right go. The pleasing thing for me was the way we defended. "They had long periods of time on our try line and I was confident we could hold out. Hopefully that continues to improve over the coming weeks." Widnes Vikings coach Denis Betts: "We're very disappointed. We're hurting badly. "The score suggests we didn't defend well but we had opportunities to win. "KR played with energy and had real purpose. Every game we play from now on is going to be like a cup final." Hull KR: Cockayne; Sio, Minns, Horne, Wardill; Blair, Kelly; Tilse, Lunt, Walker, Greenwood, Donaldson, Allgood. Replacements: Moran, Boudebza, Lawler, Green. Widnes: Hanbury; Thompson, Runciman, Dean, Chamberlain; Mellor, Heremaia; O'Carroll, White, Dudson, Houston, Whitley, Cahill. Replacements: Johnstone, Manuokafoa, Sa, Leuluai.